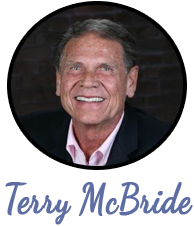 Terry McBride is an inspired teacher and he can guide you in finding your own way as you study and master taking charge of your creative mind and experience the joy and power that lies within. 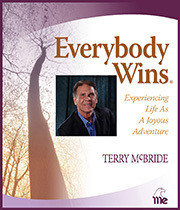 Get started now with Terry's "EVERYBODY WINS" audio coaching program. Most of you reading this have been exposed to the ideas in personal growth. The challenge for each of us is using what we know. As you listen to the Everybody Wins lessons and follow through with the daily action steps, you will learn how to integrate your choices, so the consistency you desire, comes easily and naturally. And it only takes a few minutes a day. You will receive your Everybody Wins Program as a thumb drive through the mail. It will include the audio lessons, a printed text of the lessons, the workbook forms and the daily Power Statements for the nine weeks. It also includes the audio book recording of the Hell I Can't. Each lesson is about 30 minutes in length and it is suggested that you listen to each lesson everyday for a week before going to the next lesson. You listen while you're doing something else such as driving, doing things around the house or just taking a walk. That way it is much easier to stay with it. In all, using the program takes only a few minutes a day. What happens over the nine weeks of listening to the lessons with spaced repetition and applying the ideas through the action steps is: You figure out how the concepts of choice work for You. And that is what makes all the difference. You will not be able to experience the benefits of using Terry's Program by just reading and watching the information on this site. You will have to prove it for yourself. If you are really interested in having more of the kind of life you want, you will need to step up and do things differently. Your program has a 30 day money back guarantee so why not give it a try!